My employer gave us $100 prepaid debit cards as a Christmas bonus, so I used mine to buy a better digital camera--one that actually has a flash and can store more than 20 photos at a time. It also has a zoom lens, so I might actually be able to get complete photos of my larger projects, not just the corners of them. Using size 9 circular needles, I cast on 50 (I think) stitches and knit in the round until I used the first ball. Then I tied on the second ball, and so forth. When I'm done, I plan to wash it and then hang it up so it stretches into a longer, skinnier tube. The yarn is super soft and nice to work with, and the high wool content means that the cashmere doesn't felt or pill as easily as 100% cashmere does. 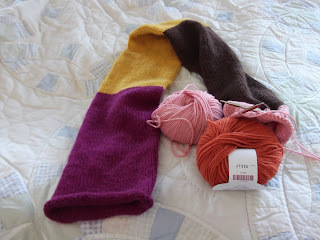 I thought about doing stripes, instead of blocks, but didn't want the hassle of carrying multiple yarns up the inside of a tube and/or cutting and knotting every few rounds. This is my current staring-at-the-TV project, and I didn't want it to be any more complicated than necessary. In other news, my sister got me a Knit Picks gift certificate. I haven't decided what to get with it yet. Do I go for more lace or sock yarn? Another discontinued kit? Or yarn to make a sweater for myself? I haven't made a sweater for myself in years. Hmmmm.....decisions, decisions. Absolutely! What's your schedule like these days?